Sun Garden Greenhouse - Blowout Sale! Sun Garden Greenhouse Blowout Sale! Special Offer - Upgrade to Forest Green or Dark Brown at no additional cost. That's a savings of $300.00! Get a Sun Garden Greenhouse Painted Forest Green or Dark Brown at No Additional Cost! 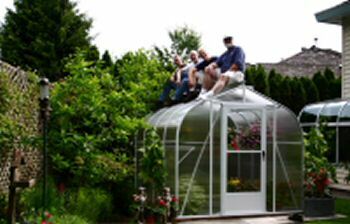 Now's your chance to get the Sun Garden greenhouses painted green or brown for the same price as painted white. The Sun Garden twinwall polycarbonate greenhouse is regularly priced at $3,723.00 and is currently on sale for $2,195.00. Now you can upgrade to have the Sun Garden greenhouse painted dark brown or forest green at no additional charge. (The regular price for dark brown or forest green is $300.00 more). Hurry, there are only a few left. The Sun Garden greenhouse kits are in stock and ready to ship. Hurry, this offer is available only while supplies last.